UV LED (light emitting diode) technology is poised to take on UV arc lamps as the next generation of UV light applications. Over the next few years, expect to see some big changes in the wide-format printing industry from printer applications and capabilities to more cost efficient operations. And, they are easy to use! But, how do LEDs compare to the incumbent mercury arc lamps? What are the technological hurdles to implement them into wide-format printers and when will these hurdles be overcome? UV digital printing is the fastest growing segment in the wide-format printing industry and has taken a central place in the graphics business. According to IT Strategies of Boston, UV-curable hardware already accounts for nearly one-third of all wide-format printers bought in 2010. UV-curable printing is clearly well-established in wide-format and is projected to grow nine percent annually from now until 2014. The reason why there is so much interest in UV-curable ink technology is because it enables the widest range of substrates to be printed. This allows owners to broaden their application offerings to the final buyers of print. With UV systems, the fact that the ink remains uncured until exposed to UV light helps to keep the inkjet nozzles open and reduces the need for maintenance and maintenance cycles. This saves ink and increases utilization time compared to solvent ink chemistry. Combined, these factors all lead to faster ROI on the hardware and greater profit. In addition, UV digital printing has opened up new opportunities and applications from printing on ceramic tiles to flooring. The UV digital wide-format printing industry has grown up using arc lamp technology borrowed from the older UV screen and flexography industry, with a few adjustments. The light created by an arc lamp spans from deep UV to visible light and into infrared. Only the UV portion contributes to the cure of the ink. Optical reflectors are used to collect as much of the generated light as possible and direct it onto the substrate. All this happens at temperatures more than 1,000 degrees Fahrenheit, so considerable excess heat is generated in the process. Arc lamps are the standard in use today because they produce a lot of UV light. Also, the broad UV spectrum they produce allowed for the creation of ink chemistries that are versatile and cure well. It is a reliable, mature technology and well accepted. 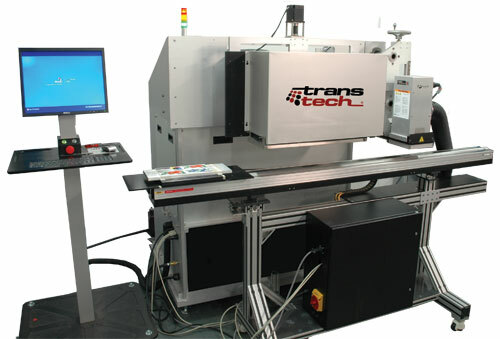 On the downside, arc lamps have required certain accommodations be made to the printer architecture, and placed some restrictions on applications. First, they produce a lot of heat which must be managed within the printer. Some of this heat is transferred to the substrate which can cause issues for temperature sensitive materials. Second, high power arc lamps, such as those found on grand format printers, produce ozone, a dangerous gas that requires special venting. Third, arc lamp output degrades over their 500 to 1,000 hour lifetime by as much as 50 percent. This introduces risks to print consistency. A Light Emitting Diode (LED) is a semiconductor device which converts electricity into light. LEDs were developed in the 1960s, shortly after the invention of the transistor. Originally used for indicators or low power illumination, they are beginning to find application in general illumination and in the more specialized fields of photo activated material processing (such as ink curing) and high brightness specialty illumination. LEDs have numerous advantages when compared with arc lamps. First and foremost, the generated light is concentrated in a narrow range of the UV spectrum. It is this narrow spectrum that leads to one of their key advantages: Cool cure. Since the optical spectrum is limited to that which the process requires, namely the UV range for ink curing, the electrical to optical conversion efficiency is substantially improved over arc lamps. Recall that with arc lamps, only a portion of the light generated is UV and much of the optical energy does not contribute to the process. Furthermore, in some instances, if this additional optical radiation is not filtered out, it may cause unwanted secondary effects such as sample heating. The higher electrical to optical conversion efficiency for LEDs means sufficient optical energy for the process can be generated with less electrical input. As a result, there is less waste energy. In the case of LEDs, the waste energy comes in heat form. The lower overall heat load for the LED system enables more compact system designs without the need for complex igniter electronics present with arc lamps (see Table 1). Other advantages inherent with LEDs include a life that can be five or more times longer than with arc lamps. This leads to an overall lower cost of ownership for this technology. In addition, it is possible to switch LEDs on and off very quickly, eliminating the need for internal or external shutters. The optical output of LEDs can be controlled by varying the electrical drive signals and allowing for electronic intensity control. This removes the need for mechanical attenuators, which further simplifies system design and improves product reliability. LEDs are more environmentally-friendly than arc lamps due to their higher effective efficiency and lack of mercury. LEDs are not without their limitations, however, which must be overcome in order to achieve widespread adoption. The most significant limitation of LEDs is also its key strength: The narrow emission spectrum. A broad UV spectrum is often needed for conventional UV digital inks to achieve good cure. These inks have been tuned to respond to the broader mercury spectrum. For older inks, the limited spectrum of LEDs can cause problems, such as insufficient cure leading to tacky surfaces or adhesion problems. Newer inks have been developed that overcome these problems, so this limitation may have passed. Until recently, an equally problematic issue with LED technology was the maximum irradiance or optical power density achievable on the printed substrate. To achieve a good tack-free surface, whether using an arc lamp or an LED, it is necessary to concentrate the optical energy sufficiently on the substrate. Arc lamps have ample energy. For example, a six or 10 inch long arc lamp rated at 600W/inch of electrical power consumption can easily produce irradiance in excess of 10W/cm2 through the use of parabolic or elliptical reflectors. This is more than sufficient to achieve good surface cure. The situation with LEDs is somewhat different. High power UV LED systems are composed of arrays of individual LED semiconductor chips called "die" (see Figure 1). "High power" LED die measure approximately 1X1 mm2, and produce up to 0.5W per device. In principle, if we could pack these individual die side by side like mosaic tiles, we would be able to achieve radiated power densities of up to 50W/cm2. Practical limitations related to cooling the LEDs, getting electrical current to each device and efficiently extracting the light created by each LED has limited the irradiance to about 4W/cm2. This level has proven marginal in achieving good surface cure; for some printing applications it is sufficient, while for some it is not. Recently, high power LED arrays with power densities of 8W/cm2 have become available, and there is talk of 12 and 16W/cm2 arrays in the development phase. Although these arrays promise to solve the irradiance challenge, they come with some cost and it is necessary to use liquid cooling to manage the amount of waste heat created. On wide- and super-wide format printers, this means added complexity to the printer architecture due to the addition of another liquid handling system and a chiller. The ideal LED array would be able to achieve power densities of 8W/cm2 or higher, while being air-cooled, thereby solving the irradiance challenge without adding complexity to the printer architecture. 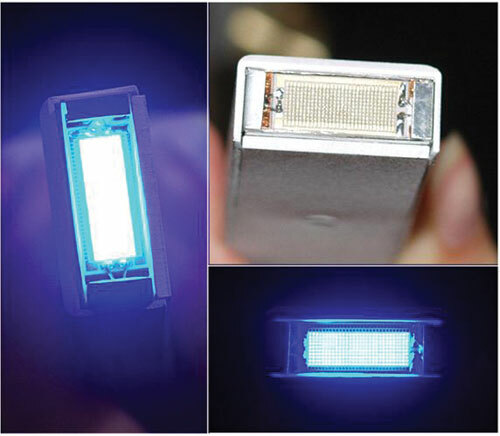 Since air does not cool as efficiently as water, special design in the packaging and optics of the LED array is required in order to achieve this ideal system. Within the UV industry, this has been a very active area of research over the past year, and commercial versions of air cooled LED systems may soon be a reality. Many UV ink suppliers have also weighed in on this issue and created new formulations of ink that have a tailored response to UV LED light. This is a challenging task given the many qualities the post-cured ink must be optimized for: Color gamut and stability, solar resistance, adhesion, surface and bulk cure, flexibility/rigidity and odor. Their efforts have resulted in inks that require less overall energy to achieve full cure (by up to a factor of three in some cases) and that have the desired surface and adhesion properties with an LED spectrum. Peter Saunders, global sales and marketing manager at SunJet, the division of Sun Chemical that specializes in inks for digital applications, also believes the future for LED-based inks and curing systems in the digital print market is strong. According to Saunders, by 2013, LED inks and curing systems should have a high degree of penetration into wide-format printers with hourly productivity levels of 25m2 per hour (or less). For these printers, curing speeds are lower so there is a good match with existing LED systems. In addition, the intrinsic features of LED make them advantageous to this segment (see Figure 2). The final issue that limits the adoption of LED systems into UV digital printers is acquisition cost. As a new technology, UV LED systems, in general, are more expensive than arc lamps. The cost of an LED system depends strongly on the number of LED die that are used to fabricate the array. The size of the array depends upon the print swath and print speed, with narrower and lower productivity printers requiring smaller arrays. LED cost also depends on the specific type of UV LED die used. Inks tend to cure more efficiently with light from the deeper portion of the UV spectrum, but this requires a more expensive type of LED. Overall, the cost of UV LEDs is trending downward and has dropped by more than a factor of 10 over the past 10 years. Much of the upfront acquisition cost of UV LED systems can be offset by the advantages they bring, both from the perspective of the printer manufacturer and from the print shop owner. 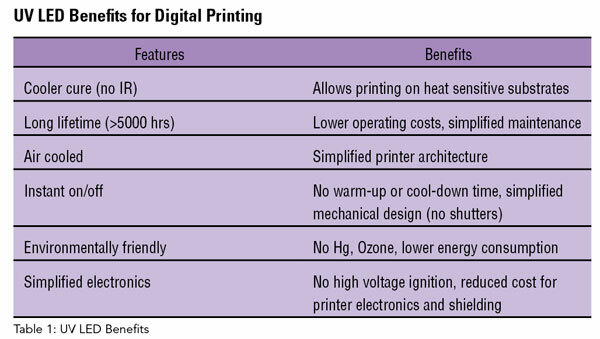 Printer architectures can be simplified, reducing overall system costs. 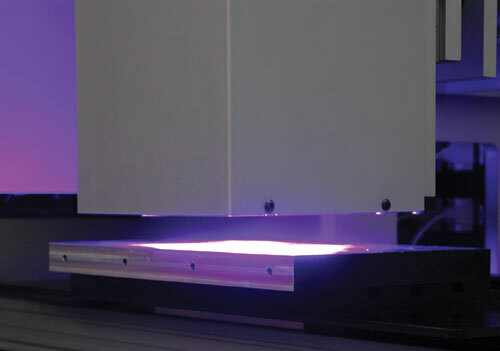 Once in the field, UV LED curing systems will have lower running costs and provide shop owners with energy savings. Due to the long life of the LEDs and the reliability of this solid state technology, service and maintenance costs will be reduced, and it will no longer be necessary to perform the expensive replacement of arc lamps every 500 to 1,000 hours of use. The cooler cure of an LED system also opens up new print applications on temperature sensitive substrates for print shop owners, which helps expand business potential. According to Chris Sobaszek, business unit manager, digital at ITW Transtech: "The option to use an LED curing solution on the InDecs SPM printer has opened new markets where traditional UV lamps have been unable to penetrate" (see Figure 3). Despite the potential limitations described previously, LEDs are used effectively. In both wide-format and label printing, more than 30 percent of the UV-curable products offered feature LED pinning or full-curing - a remarkable statistic given that the technology is still early in its development. It illustrates the need and desire for new technology that can print with less heat, less energy and on a wider range of substrates. Furthermore, IT Strategies projects that the number of manufacturers that will offer LED curing will continue to increase rapidly, with nearly 50 percent of label printers offering products that feature LED curing by 2015. 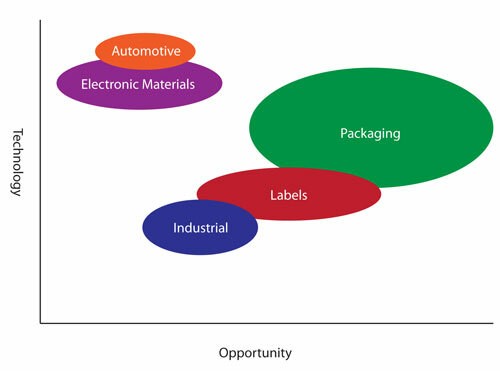 Saunders is also bullish on the adoption of LED solutions in the single pass label press and product-marking segment of the digital print market. A large number of the substrates typically used in these printers are temperature sensitive, so the cool curing offered by LEDs provides a real advantage (see Figure 4). The UV LED industry, working in partnership with printer manufacturers and ink suppliers, is well on the way to achieving all three. Adoption will most likely take place on a printer-by-printer basis, determined by the target applications and available UV digital inks. Those print applications that have integrated LED curing to date have included lower productivity printers with narrow print swaths. For these applications, the power, irradiance and cost elements of the curing system have been optimized. Over the next five years, as the technology advances along these three vectors, we will see UV LED curing integrated into higher productivity and higher-end printers. The digital UV wide-format market continues to grow and is drawing in new technologies as it matures. The industry has started to take advantage of the tremendous advances in UV LED light sources, bringing to the print world all the reliability and functionality they offer. This enables a new generation of printers to print a greater range of applications and provide higher reliability, easier operation and lower operational costs. Don't think sunscreen when you hear UV, think LED!